Check our main site at http://info.SHOWMOMTHENEWSLETTER.COM and find out how we work. Hawaiʻi island peace activists reported that elevated levels of uranium have been found in residents’ urine and demanded that the State of Hawaiʻi Department of Health take more aggressive measures to investigate the cause of this contamination. After falsely claiming that the Army had not used Depleted Uranium (DU) in Hawaiʻi, the Army now admits to DU contamination in Schofield (Līhuʻe, Oʻahu) and Pōhakuloa Training Area. The Hawaiʻi County Council passed a resolution calling for a moratorium on live fire training in Pōhakuloa as long as DU contamination is present. 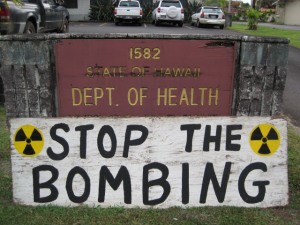 A group of 2 dozen Big island residents, many wearing Hazmat type suits, dramatically urged the State Health Department (DOH) to stop being bystanders and become pro-active advocates of public health over the issue of Military Depleted Uranium (DU) radiation contamination at the Pohakuloa Training Area (PTA). 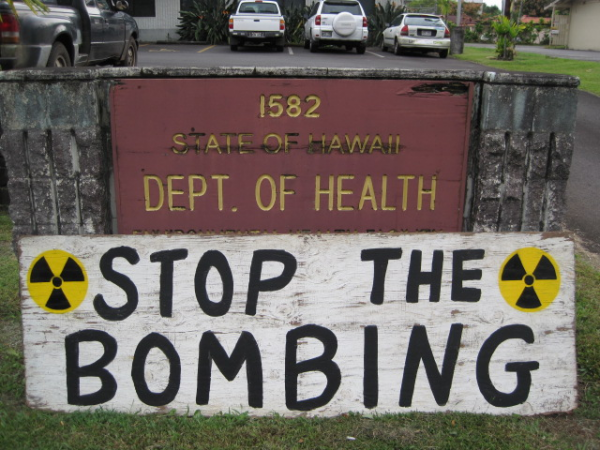 In a protest organized by Malu ‘Aina at the Hilo DOH Environmental Health Office, citizens prodded the DOH to follow the Hawaii County Council’s action call in Resolution 639-08 to stop all live-fire and other activities that create dust until there is a clean up of the uranium contamination at PTA. There were several signs with the well known radiation symbol. Other signs read “Test For Radiation; Why Uranium in Urine? ; No More Radiation; Peace thru Poison?, Time to Aloha ‘Aina; Time to Mother Earth; DU equals Dirty Bomb, Sacred Mountains under Siege.” There was even the appearance of a well known Hilo resident, playing the role of Governor Neil Abercrombie. Request an exemption for the US Army from licensing residual Davy Crockett M101 DU on its operational ranges under the provisions of 10 CFR § 40.13(c)(5) or 10 CFR § 40.14(a). The Nuclear Regulatory Commission (NRC) will be issuing a license for the mongoose to guard the hen house in Hawaii. The Army will be issued an NRC license to possess Depleted uranium (DU) in Hawaii at Schofield Barracks and the Pohakuloa Training Area (PTA). In effect, the NRC is licensing Hawaii nuclear waste dumps and allowing those dumps to be bombed, spreading the nuclear dump debris wherever the wind takes it. The State Dept. of Health made no comment, nor did it ask any questions, following the meeting. It is a fact that DU exists at Schofield Barracks and PTA, and perhaps other present and former military sites in Hawaii, including Kaho’olawe and Makua Valley. How much is not known. A minimum of 700, perhaps more than 2000, DU Davy Crockett spotting rounds have been fired at Pohakuloa. Less than 1% of PTA’s 133,000-acres have been surveyed. DU cluster bombs, and more than a dozen DU penetrating rounds, DU bunker busters, etc. may also have been fired at PTA and elsewhere. All branches of the US military use DU weapons today. It’s clear to me that we cannot rely on so called regulators to fix the problem. Nuclear regulators are just as much part of the problem as bank regulators. The DOH is also part of the problem. Where have our health officials been all these years on the issue. The military in Hawaii has lied and use deception repeatedly. The US military mission goes before concern for the health and safety of its own troops and Hawaii’s people and land. Uranium is now showing up in Big Island residents’ urine. Is it related to PTA, Fukushima or what? The people have a right to know. Is the military above the law? What’s needed is a peoples’ movement of non-violent resistance to stop the bombing to protect the people and land of Hawaii against attacks by the U.S. military. Jim Albertini Malu ‘Aina Center For Non-violent Education & Action P.O. Hawaii’s peace activist group need to address-include HI Dept. of Health in sourcing blame of the uranium count reading in the urine of Big Island residents, insist on enlarged research and monitoring of RADWatch readings and keep the islanders’ informed. Since Fukushima 3/11/2011 explosive nuclear mishaps, individual RADWatch readings have shown a spike in radiation contamination over the islands. We are aware, the Japanese government has not revealed true status of Fukushima’s contaminant level containment, do only when faced with explicit scrutized evidence that cannot be further concealed from their people and the global communities. We live in the planet’s upper hemisphere in line with airflow currents from Japan latitude … Hawaii’s people breathe-eat contamination through the air-water-food … the elements are the contaminating venue the human body is gleaning-eliminating out. Government entities can’t hardly sequester the human population … if they even conducted reading research, it would possibly find Western countries rank higher due to medical protocols the system deem applicable ~ its a self inflicted problem that add to much of the ill’s and ailments in our society, besides the reckless unmonitored, unaccountable use of DU munitions on arable, livable precious land, the premium resource the people of Hawaii has so little of, access to … why there is no adequate response of possible solution to cause when confronted by the public with why-how-when! We are seeing effects of military-medical-nuclear energies misuse and mishaps.